Name Variation: Concepcion Ramos was also known as Conchita Conchita is a nickname for Concepcion. Death*: Concepcion Ramos died on 23 January 1913 at San Salvador, El Salvador. The internment of the cadaver of the very esteemed matron, Doña Concepción R. de McIntire, was attended by numerous an selected concurrence, an evident proof of the high esteem that the deceased had during her life. The home of the McIntire family is submersed in the most painful of sorrows. The firm maternal backbone is now missing, and today her children surround their heart broken father who has forever lost the companion of his life. That home, model of homes, because of their noble qualities of hard work and honesty, is now convered with the black crape of orphanhood, and is an example of the worthiness of the union of two beings that love and virtue has merged together. This is the reason that we, the friends of the McIntire family, lament the irreparable disgrace that is now overwhelming them, and we pray that resignation mitigates their grief. [S1517] Family of Bartholomew McIntyre 1897 San Salvadore Photo; Sal Bigone Photo Collection. [S2532] Joanie Zandona, "Maria's DNA," e-mail to Elaine Beaudoin, September 14, 2017. [S1931] San Francisco Area Funeral Home Records, Accessed July 22, 2014, Ancestry.com online. [S1781] Certificate, Bartholomew McIntire and Concepcion Ramos marriage of July 7 1887, Certificate provided by Patricia Morales Tijerino, July 15, 2013. [S1519] Concepcion de McIntire, Memorial Card, January 23, 1913 Sal Bigone Photo Collection, A facsimile in held in the files of Elaine Beaudoin. [S945] Facebook, online www.facebook.com, Message from Marina McIntyre-Steffan, June 21, 2012. [S1840] Bartolo McIntire Probate file No. 41592 (Death), Authenticated copy of Will filed April 30, 1915. Marriage*: He married Lorraine Alice Cooper. [S924] Kalamazoo Gazette, February 24, 2007, www.genealogybank.com, accessed May 11, 2009. [S1150] Catharine Reck Batke, 367-12-0849, Social Security Application, Internal Revenue Service. (Witness) History: Katherine Reck witnessed Russia enters World War I against Germany and Austria-Hungary and suffers a series of crushing defeats. in 1914. Note: However, Katherine Reck and Henry Batke can be located neither in Alabama nor Michigan between March 1922 and October 1924. Death*: She died on 28 October 1979 at Claremont Nursing Home, Benton, Berrien County, Michigan, USA, at age 89. Information on Death Certificate signed by Katherine Fredrick, 1332 Wolcott Ave., St. Joseph, Michigan 49385(?). 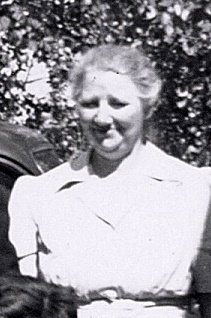 This is her daughter, Katherine Batke Fredrick. K. Schmeichel - Mrs. Katherine (Batke) Schmeichel, 89, of Route 2, Box 470, Coloma, died Sunday evening at Claremont Nursing Home, Benton Harbor. Funeral services will be held Wednesday at 2 p.m. at Kerley and Starks Funeral Home, St. Joseph, where friends may call beginning at 7 p.m. today. Burial will be in Riverview Cemetery. Memorials may be made to Trinity Lutheran church of which she was a member. Mrs. Schmeichel was born October 14, 1890, in Cortiza, Russia. Survivors include: five daughters -- Mrs. Katherine Fredrick, Mrs. Alex (Anna) Pesko, Mrs. Robert (Ruth) Jonatzke, all of St. Joseph. Mrs. Arthur (Mary) Engler of Coloma, Mrs. Olin (Selma) Smith of Seminole, Okla; three sons -- William and Henry Batke, both of St. Joseph, Edwin Batke of Coloma; 20 grandchildren; 24 great-grandchildren; and one sister, Mrs. Lena Kampes of Hamm, West Germany. [S1013] Katherine Schmeichel, Michigan Medical Certificate of Death. [S1074] Henry Batke entry, part SE, section 22, township 14, range 6, west of the 3rd meridian, Homestead Patent application: Saskatchewan, Canada. [S1009] Batke-Bednark Marriage License: Book 105, Page 363, Application 486. [S1010] William H. Batke, Illinois Medical Certificate of Death. [S1072] Polk, Polk's Benton Harbor (Michigan), City Directories, FHL#1930287; 1925, Page 329. [S1072] Polk, Polk's Benton Harbor (Michigan), City Directories, FHL#1930287; 1926-27, Page 373. [S1072] Polk, Polk's Benton Harbor (Michigan), City Directories, FHL#1930288; 1929, Page 402. [S1072] Polk, Polk's Benton Harbor (Michigan), City Directories, 977.411/B4 E4p; 1930, Page 180. [S1002] U. S. Social Security Administration, Edwin A. Batke, accessed November 15, 2006. [S1039] Henry Batke, Michigan, Certificate of Death. [S1044] Schmeichel-Batke(Reich) Marriage: FHL #1954661, Item 1. [S1045] Gustave Schmeichel, Michigan, Certificate of Death, FHL #1954714. [S230] James Thomas, Illinois Death Certificate. [S183] Bridget Thomas, Illinois Death Certificate. [S179] 1870 US Census, Illinois, Cook County, Chicago, Washington, DC, Ward 6; Page 142, line 17. [S1286] On-line baptismal record transcription, Bridget Thompson Baptismal Record: www.rootsireland.ie, accessed January 3, 2011, October 10, 1852, St. Mary's Church. [S1300] Mary Thomas entry, St. Munchin's, Limerick, County Limerick, birth registrations volume 20, page 393, no. 29, Family History Library, MF# 101119 (September 12, 1865). [S1291] Bridget Thomas, Virginia Passenger List, September 8, 1866, Ancestry.com, accessed January 4, 2011, M237, Record Group 36 National Archives, Washington, DC. [S179] 1870 US Census, Illinois, Cook County, Chicago, Washington, DC, Ward 6; Page 142, line 17, Ancestry.com; accessed March 3, 2006. [S186] 1880 US Census, Illinois, Cook County, Chicago, Washington, DC, ED 36; page 460 A and B, Family History Library, MF# 1254187. [S183] Bridget Thomas, Illinois Death Certificate, Ward 6. [S1287] On-line baptismal record transcription, Patrick Thomas Baptismal Record: www.rootsireland.ie, accessed January 3, 2011, August 26, 1857, St. Mary's Church. [S1290] On-line baptismal record transcription, Marian (Mary) Baptismal Record: www.rootsireland.ir, accessed January 3, 2011, September 19, 1865, St. Mary's Church. [S658] 1920 US Census, Pennsylvania, Philadelphia County, Philadelphia, Washington, DC, ED 1662, Page 4A, Ward 44, Ancestry.com; accessed December 13, 2005. [S720] 1900 US Census, Pennsylvania, Philadelphia County, Philadelphia, Washington, DC, ED 490; Page 4A; Ward 22, Accessed October 18, 2006. [S659] 1910 US Census, Pennsylvania, Philadelphia County, Philadelphia, Washington, DC, ED 1134, Part 2, Line 15, Ward 44, Ancestry.com; accessed December 13, 2005. [S2752] Pennsylvania Marriages 1852-1968, online www.ancestry.com, Francis P. Green and Annie Reilly, file number 001276664; Philadelphia, Philadelphia County, Pennsyvania. Accessed January 21, 2019. [S2753] 1940 US Census, Pennsylvania, Philadelphia County, Philadelphia, Washington, DC, ED 51-1851, page 88, Accessed on Ancestry.com January 21, 2019. [S1220] 1920 US Census, Pennsylvania, Philadelphia County, Philadelphia, Washington, DC, ED 1662, page, 5A, Accessed September 5, 2010, Ancestry.com. [S1215] 1901 Irish Census, County Cavan, Stradone, Drummuck, Dublin, Line 11, Accessed online http://www.nationalarchives.ie/, September 4, 2010.